There are times when “Not for Ourselves, but for Others” cannot be better defined than it has been here. On 16 July 2015 Peter McAleese launched a sequel to his autobiography “Beyond no mean Soldier” at the Oriental Club in London. Peter McAleese is the renowned special forces operator who served with British, Rhodesian and South African Special Forces over his illustrious military career. One thing Peter was not expecting at his book launch was for Lgr Sean Renard from The South African Legion to source, buy and return his original SADF “Slangvel” (snakeskin) paratrooper smock to him. 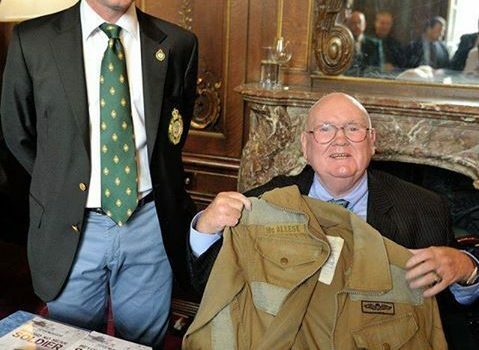 Accompanied by members of the South African Legion, Lgr Cameron Kirk Kinnear introduced the concept of the SADF smock and produced a standard smock before handing a surprise “present” to Peter from Sean. To see an old soldier of such standing light up with joy and surprise when such a prized possession as his personal “slangvel” is handed back is truly a privilege. The handover became a highlight of the book launch and the publishers have expressed their deep thanks to the Legion for our support. Such a random act of kindness speaks volumes for the calibre of the people in the South African Legion and we say “Bravo Zulu” to Sean – well done indeed. In the photo is Sean and Peter holding up his “slangvel” – photo courtesy and thanks to another Legionnaire in attendance Theo Fernandes.